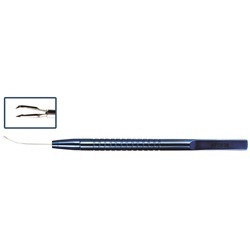 Curved shaft, 23 gauge with micro grasp tips that measure 2mm in length and 0.7mm in width. Round, serrated, squeeze action handle. Overall length: 90mm.